A major search operation got under way in Southampton Water yesterday evening when a tug suddenly capsized and one of the crew could not be found. At 7.15pm the Coastguard received a Mayday call from a sailing yacht reporting that a tug had capsized at the Fawley marine terminal. The tug, the Asterix, attached to oil refinery at Fawley, subsequently began to sink just off the refinery’s pontoon. One crew member of the Asterix managed to jump clear and swim to to the shore, where they were treated for hypothermia. Another man was still unaccounted for. The Coastguard co-ordinated a search of the windswept waters for the second crew member involving RNLI lifeboats from Lymington, Calshott and Cowes and Coastguard Rescue Teams from Southampton and Lymington and Southampton Port patrol vessel, using powerful searchlights. One lifeboat crew banged on the hull of the Asterix, still visible at this stage above the water, but received no response. A Fawley emergency employee who was watching the capsized vessel from the pontoon then just glimpsed an arm in a small pocket of air behind a window. Without hesitation the employee leapt into the water, smashed the window and extracted the trapped crew member. 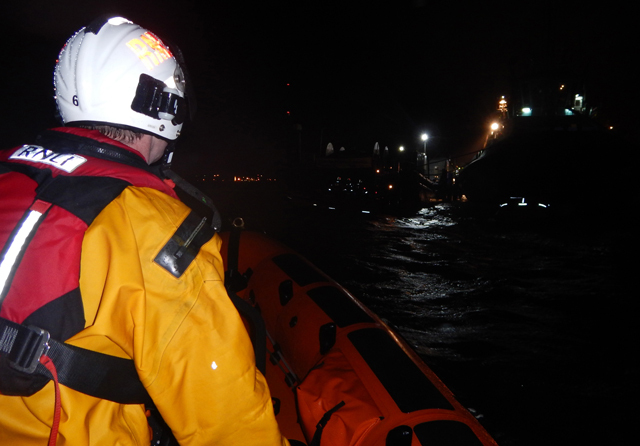 Both were evacuated from the water just before the tug sank, at around 8.30pm. Both the rescuer and rescued, plus the man who had swum clear earlier, received immediate emergency care from the attending paramedics and RNLI crew members training in casualty care. All three men were then taken by ambulance to hospital. Among the four Cowes lifeboat crew was Dr Will King who helped provide medical care to two of the casualties. Joining the three lifeboats in the search was another Fawley tug, Ibex, together with Red Funnel’s car ferry Red Eagle and catamaran Red Jet 4. A Coastguard spokesman said weather conditions on scene last night were strong winds and poor visibility. Cowes lifeboat returned to station at 10.15pm.